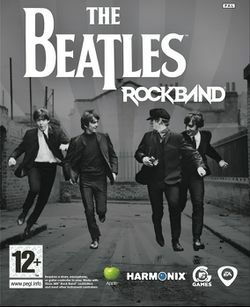 The Beatles: Rock Band is a music game developed by Harmonix and published by MTV Games. It is the third major console release in the Rock Band series and, like other games in the series, it allows players to simulate playing music by using controllers shaped like musical instruments. The game consists of 45 songs by The Beatles, spanning the band's career, along with virtual depictions of the band members performing the songs. Future downloadable content for the game will feature additional songs and full albums from The Beatles, such as the entirety of Abbey Road shortly after the game's release. The game was released world-wide on September 9, 2009 coinciding with the release of new, remastered CD versions of The Beatles albums. The game is shipped as a bundle with themed instrument controllers and as a standalone game for which all existing Rock Band and compatible music game accessories can be used. The game incorporates many of the gameplay features of the Rock Band series; however, it is not an expansion pack for the Rock Band series, and content for it and other Rock Band titles will not be cross-compatible. The game has been developed with the blessing and critical input of Apple Corps, including former Beatles members Sir Paul McCartney and Ringo Starr. George Harrison's son Dhani championed the game's creation and helped to bridge discussion between Harmonix and Apple Corps, while Giles Martin, son of The Beatles' music producer George Martin, was able to assure high-fidelity audio from songs recorded on older mediums to integrate properly with Rock Band's gameplay. The Beatles: Rock Band features virtual representations of the popular quartet and their ten-year career as a band. Gameplay mechanics differ slightly from previous Rock Band games; in particular, the addition of a three-part vocal harmony system. This page was last edited on 17 August 2012, at 17:15.